After many years of hiatus, Arise Fashion Week is making a comeback and this time around, the fashion brand known for promoting Africa’s fashion industry is reemerging with a bang for its 2018 runway show in Lagos. Kickstarted on the 30th of March to round up on the 2nd of April, the 4-day fashion event is really setting pulses racing, because not only is it featuring 45 designers from 15 countries, (which includes South Africa, Botswana, Tanzania, Uganda, Kenya, Ghana, Ivory Coast, Senegal, France, Morocco, UK, US , the Caribbean and of course, Nigeria), but the 2018 rebirth show is pulling out the big guns when it comes to modelling. One of the iconic models taking the lead is none other than the International acclaimed supermodel, Naomi Campbell, who teetered to and fro the runway at the prestigious Lagos Intercontinental Hotel last night. 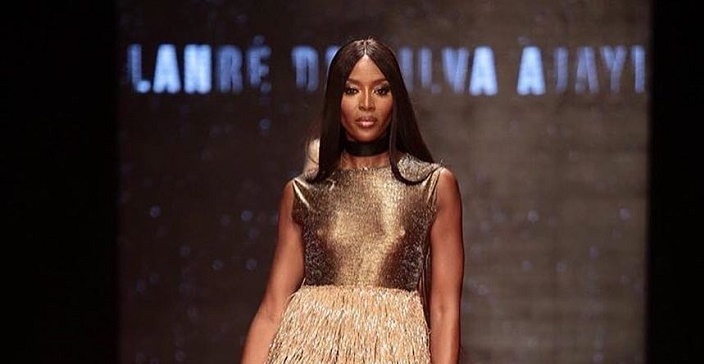 Like the original supermodel that she is, Naomi made a surprise runway appearance for Nigeria’s womenswear brand Lanre Da Silva and South African design duo Kluk CGDT, which, of course, was unexpected for the show-goers. She was pictured wearing a stylish champagne-peach colored look featuring a heavily fringed skirt, which hails from the brand’s latest collection. The British model was also joined by Ex-international supermodel Oluchi Orlandi, as well as Ojy Okpe, who has strutted the catwalk for designers like Oscar de la Renta, Jean Paul Gaultier, Versace, Moschino, Ralph Lauren and Dolce & Gabbana and a host of others. As for the Kluk CGDT show, Naomi wore a couture-worthy, lilac geometric-print coat dress finished with a dramatic fringe. She kept the look minimal, offsetting it with a pair of gold heeled sandals. According to Arise Fashion, which has promised to bring unforgettable runway show, Naomi is scheduled to make more runway appearances as the show continues.